There are so many holiday specials out there. I can definitely take or leave most of them , but my very favorite is actually kind of hard to find in most line-ups. 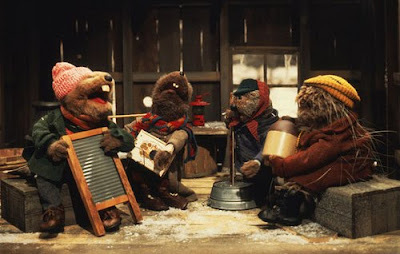 Emmet Otter's Jug-band Christmas is based on a Russell Hoban/Lillian Hoban (of "Frances the Badger" fame) story and has all the sweet natured charm and humor of the classic Muppets. Jim Henson developed this " 'Gift of the Magi' with a twist" tale of Emmet Otter and his Ma and it should be a staple of the season. With all of the junky holiday television programming out there these days, it is just nice to see a production with some Christmas spirit....the furry Mupppets are a bonus! Christmas is approaching in Frogtown Hollow, and Emmet Otter and his Ma hope to buy gifts for each other. Unfortunately, Emmet doesn't make enough from the odd jobs he does, and Ma doesn't make enough as a laundress. They decide to compete in the Frog Town Hollow Talent Contest in order to win money, but Ma will have to hock Emmet's tool chest to buy a costume, and Emmet will have to put a hole in Ma's washtub for his band! OMG. I totally remember this now! Yes, it is such a childhood classic.